I am not usually a reader of biographies, and certainly not a ravenous one. But when it comes to Edmund Morris' works, I break character. Like The Rise of Theodore Roosevelt before it, I devoured Theodore Rex. Though I had a false start--I tried to read it immediately after the magisterial first volume of the TR trilogy and burned out about a third of the way through--once I put some distance between myself and The Rise, I was captivated all over again. Morris has such a (seemingly) effortless talent for writing. He is literary, but to my untrained eye, style precipitated no sacrifice in scholarship. 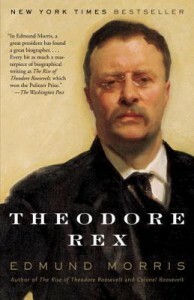 Meticulously researched and rapturously written, Morris is obviously a man deeply fascinated by Roosevelt. Much to his credit, though, he presents Teddy as he sees him, which is thankfully not free from his many warts. An admiring biography, but not a hagiography.